Dubai, UAE, January 30, 2019: Be a part of a revolution in the world of innovation in Niche Perfumery. My Perfumes creates a fragrance rampage by introducing to the market, perfumes that are alcohol free yet long lasting. With their non-alcoholic (no ethanol) range of perfumes, it employs transparent, sprayable and a high dosage of new compounds to enhance the user-experience by providing a wide range of lasting fragrances. The unique olfactory signature will leave you asking for more and will then satisfy that with a wide range of differing experiences. What make these fragrances special are the formulations that are chemically sound and safe for the environment. 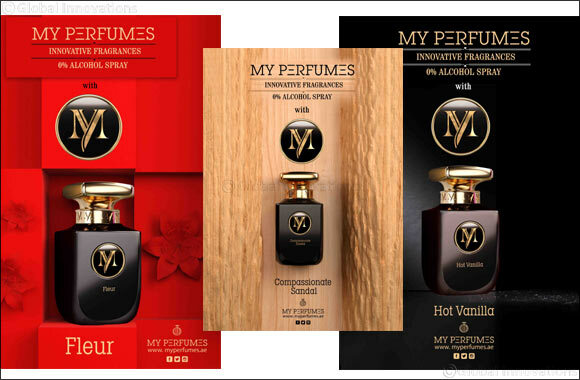 The newly introduced ‘MY’ range includes some of the most spell-binding fragrances aptly named Fleur, Powdery, Rustic Oud, Compassionate Sandal, Hot Vanilla and Intense Orris. They are rich in texture and their silkiness embraces your skin smoothly, leaving it refreshed. Starting with Fleur, its swaying sweet aroma is tempered with authentic floral spices and woody essences to set a perfect harmony with a musky tinge. Powdery woos you with its refreshing version of vanilla infused with exquisite and appealing aroma. Casting the heroic impression, Rustic Oud combines the traditional royal oud with modernity only to deliver the enigmatic allure. Rich in natural elements, the scent-clad sandal is composed to retain its fragrance for decades to come. The leathery finish to the woody piece, canvases the avant-garde portrait of regal Compassionate Sandal. The warmth of vanilla cocoons elegance in the most adorable manner to bake a sizzling chemistry between vanilla and trendy aromas to craft Hot Vanilla. The intensity of the scent in Intense Orris is deep enough to emanate freshness that paves the way for coolness of sandalwood and its timeless fragrance. The range starts from AED 670 and comes in 100 ML packaging. All these fragrances and more are available at their very premium and exclusive showroom at Gold Souq, Diera. Made in Dubai, these perfumes strike the perfect chord with your taste for elegance. ‘My’ is for ‘You’, the unique You.